I feel this game has been unfairly maligned. Like cutting off the head of a flatworm, Descent is one piece of a roleplaying game that has matured and grown into it's own entity. It's the combat, but without the improv. 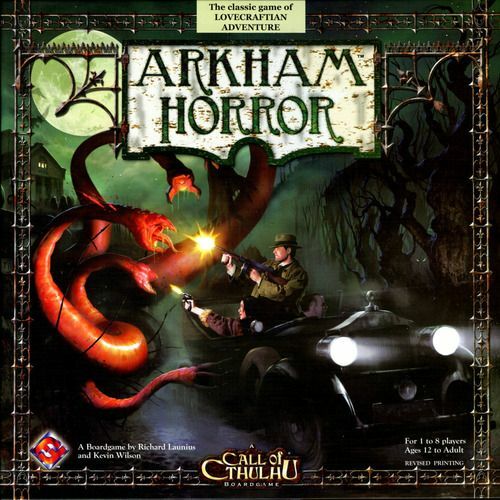 Similarly, Arkham Horror is the story without the player creativity. You roll a lot of dice, you spend a lot of time listening, and the fun of it is in hearing of the strange and terrible events inflicted upon your characters, and, occasionally, cheering together at an improbable success. It's not very strategic, sure. The theme is: "prepare, then hope for the best". If you oversimplify it, all you do is choose a location to go to in the movement phase, then later have an encounter in that location where you roll some dice based on your stats. Good things happen if you succeed and bad things happen if you fail. Yet the game still has a lot of personality, and a whole lotta stuff happens within those basic confines: combat, equipment, character building, injuries, allies, encounters specific to the location and situation — the number of decks of cards in this game is absurd. After about four hours, and many laughs, the six of us defeated the old one Shudde M'ell in combat. All in all I must say I had a blast. All those that told me Arkham Horror was a tedious random slog: phooey to you. It's a long game, but if it's choice between this and three games of Pandemic I think I would rather play Arkham. Eldritch Horror, which I've played twice at the club, apparently the streamlined and improved version, has more room for strategy: instead of the simple movement phase it has a whole action phase, where you have potential for many combinations of actions. But often, because of the randomness, there's not one combination that is clearly better — a rest, or a buy, or a train ticket, or a boat ticket, or a focus? It's usually a crap-shoot because you don't know what you're preparing for, but you'll sure spend extra time trying to work it out anyway, which slows the game down. I'm not sure this type of game benefits from the extra options much. Things almost never go to plan anyway, and the fun of the game is in the encounters so beefing up the game that happens between those encounters could make the game better or could be counterproductive — I'm not decided yet and will have to play more games of both. One thing I am quite sure Arkham Horror does better than Eldritch is the locations. Arkham takes place in a city and the locations fit with the actions (you can get weapons if you go to the police station, money if you go to the bank, clues if you go to the science building). In Elditch, why are you more likely to improve strength if you go to Sydney, or observation if you go to San Francisco? Arkham also has locations where you can be sure of the effect (the shop, for instance, where you know you can draw three common items and buy one), whereas everything in Eldritch is a random event. Arkham seems to give you more hope, more confidence that you'll get something you want in the deck (even if you never do), more known encounters. It tells you that if you get a gate token or a monster trophy you can trade it in for an ally at the boarding house or a blessing at the church, dangling a carrot over you head, giving you positive reasons to fight, rather than just kicking you forward and hoping you enjoy it. I don't know why they took that sort of thing out of Eldritch. Jane: "You cannot spend more than 2 Clue tokens to add to any Speed check." Sam: What's the name of the card? Jane: Sprained Ankle. "If you ever gain another Sprained Ankle card-"
Sam: -you have two sprained ankles?